I am a huge fan of liquid smoke now. I never tasted it before making these waffles, but I really am now. I know, I know, I’m getting ahead of myself, I just don’t want anyone to be turned off when they read the ingredients list. We at As Eaten are aware that not every food idea on television is a good idea. Homer Isn’t Wrong About This One. This is from the fourth season of The Simpsons, where homer decides to skip church one cold winter Sunday. The waffle becomes an integral part of that day (and Homer’s subsequent decision to leave the church). I don’t know that these are so good they’ll make people give up religion and become hedonists, but it might make hedonists want to add this recipe to their own Sunday morning ritual. Blend well. If you have the instant kind, follow the recipe on the package. – 5-6 Caramel Squares, easily obtainable around Halloween, but Kraft makes and sells them year round. This is if you’re a traditionalist. If you just want the caramel flavor, you can use caramel syrup, with negligible loss of flavor. While I made a point to identify myself as a traditionalist, for the most part I stand by that. But the caramel squares are a bit of a wild card here. If you opted for the caramel sauce, your life just got a lot easier. If you got the candy, you can crack open the squares and throw them on the batter as homer did, but I didn’t do that because I borrowed Katrina’s waffle iron (and that would play hell during cleanup). They can also be arranged evenly through out the batter, though I warn you the insides of the candies will not even get warm before the waffle burns. Alternatively, you could slice the caramels thinner and then arrange them (a much better plan). Or you can do what I did and melt the caramels first in a double boiler and then add them to the batter. If you go this route, be sure to add it to the batter that is already on the waffle iron, as the caramel congeals quickly and will not mix into the batter. No matter what, unless you use caramel sauce, you’re going to have pockets or clumps of sweet caramel. No one is going to complain about that. Don’t forget to get some of that waffle runoff. 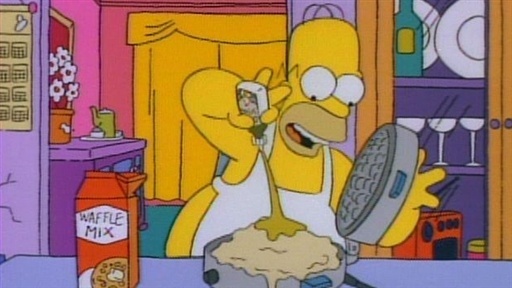 At the end of the clip, Homer wraps it in a whole stick of butter and eats it like that. That is just a bridge too far, even for me. I can’t do that. I physically can’t do that. The thought of biting into a stick of butter or margarine makes me queasy. I opted instead to use a normal, tolerable amount of butter. I don’t recommend syrup because the waffle itself is pretty sweet and tiptoes my sickly-sweet threshold. You may have a higher tolerance than I do. My brother always did (he is the inventor of the Ice Cream Sundae Eclair Doughnut), so I might be kind of a sugar wuss. So try it how you like it. You might even like an entire stick of butter with it. 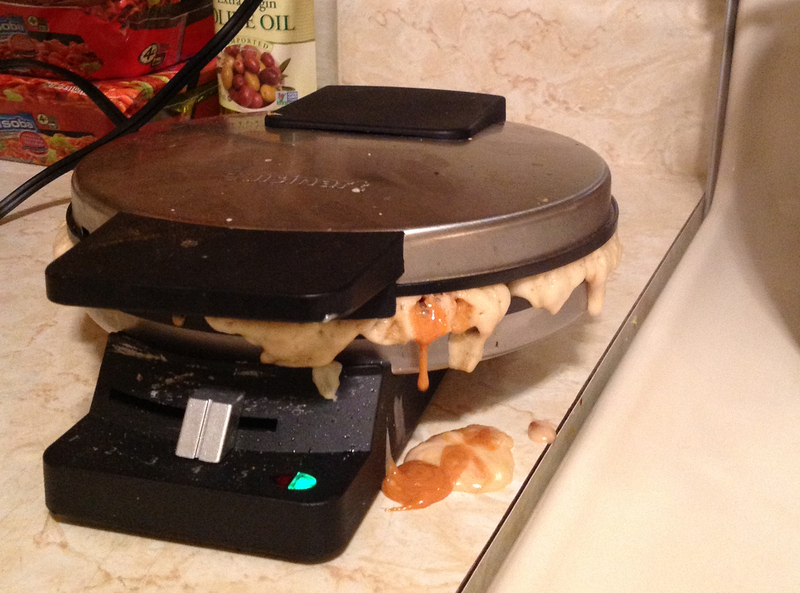 One final caveat: With cheaper waffle irons, there is going to be uneven heat distribution. With normal waffles, this is no big deal. When dealing with the caramels, you may want to avoid that spot as the caramel will burn long before your batter is crispy if the hotspots are too high. My waffles were noticeably darker in the middle rim, as is usually the case with the smaller Cuisinart brand irons. They even look pretty good. 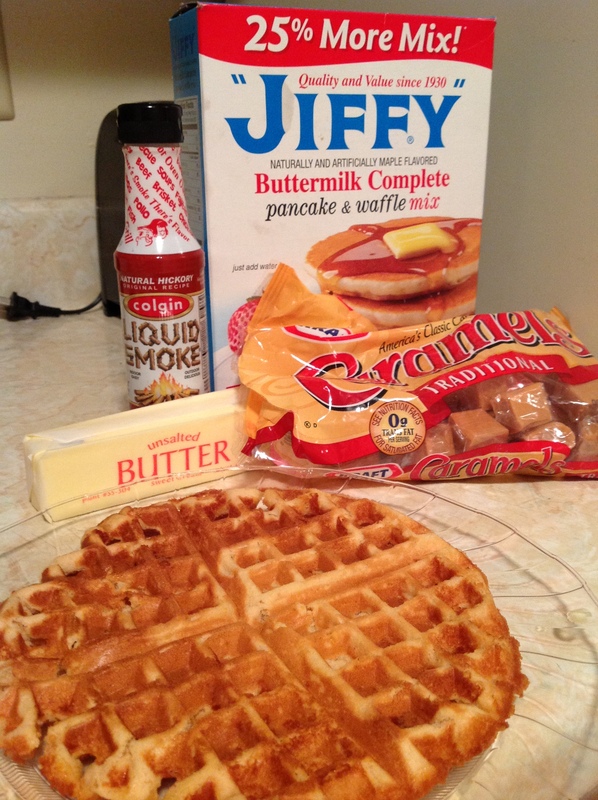 This recipe makes three to four normal size waffles, give or take the amount of butter you need to accompany them. Above is an undoctored photo… they can turn out very well: crispy and golden brown, sweet and smokey. And don’t throw away that liquid smoke. It’s also great in everything. Ever.